Looking for a way to infuse a little fun into your wardrobe? Look no further! 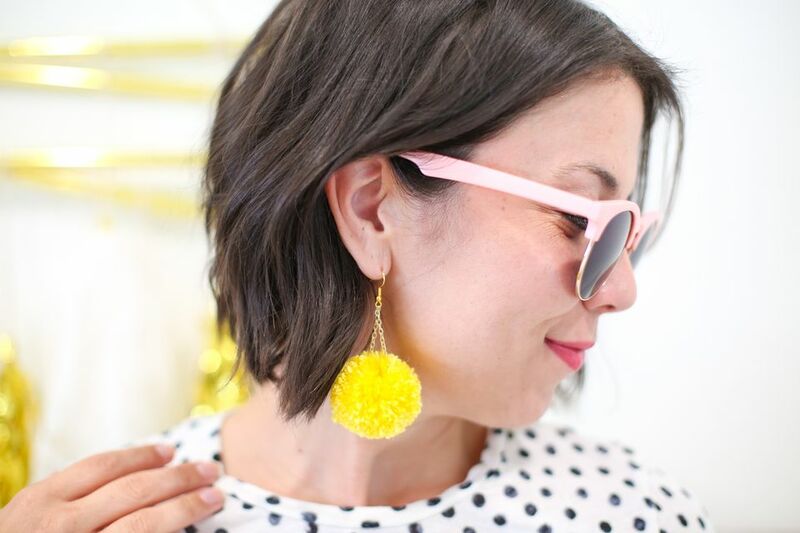 Handmade accessories are the perfect way to add a pop of color and whimsy into your daily look, and these DIY pompom dangle earrings check off all the boxes! You can make these in all sizes and colors, or even create multi-colored pompoms to wear loud and proud. The gold dangle chain adds a polished touch to these fun stunners. They're so easy to make we bet you'll want to create a pair for all of your pals. Choose your favorite shade (or shades!) of yarn, and gather the rest of your supplies. Wrap yarn around both sides of your pompom maker. Wrap one side first, creating a thick coverage of yarn equally spread around the arms of the pompom maker. Cut the end of the yarn once you've reached your desired thickness. Repeat on the other arms of the pompom maker. Add a 4" length of chain around one side of the pompom maker. Leave the open ends of the chain dangling toward the outside of the pompom maker. Fold in the arms of the pompom maker, being sure to keep the chain in place but not pinch the links. Use the tips of your scissors to snip down the center of the yarn on both sides of the pompom maker. Be careful to keep the arms of the maker closed so that the pieces of yarn stay in place. Cut an 8" piece of yarn. Slip it between the two halves of the pompom maker. Tie the two ends of the yarn in a double knot (the knot will slip in between the two halves of the maker so that you can't see it). Be sure it's tight so that it holds all of the pieces of the pompom together, but don't knot it so hard that you break it! Unfurl the arms on both sides of the pompom maker. With the arms open, pull apart the two halves of the pompom maker. This will leave you with your pompom, still tied with the long piece of yarn and with the chain running through it. Use your scissors to give your pompom a little hair cut. Trim away excess yarn on all sides until you have a nice round shape. Use jewelry pliers to gently open a link in one side of the chain. Remove any excess chain and attach the open link to the loop in your earring back. Do the same with the other chain on the same pompom. Repeat the process to create another earring, put them on, and have fun!